With the 2010 Premier Developement League quickly approaching, the Springfield Demize looks back on former athletes that have used the USL experience to push themselves to greater heights. The Springfield Demize offer’s their players the chance of a lifetime, to play at the highest level over the summer, with a chance to shine at the 2010 USL Player Combine, where they have the chance to get scouted and make the next step to professional soccer. Nikola Katic was a two year captain of the Demize, playing two years at Western Illinois. Katic began his two seasons at Illinois Central College, being named to the NJCAA All-Region team his freshman year, before making the NJCAA All-American team his sophomore year where ICC was ranked third in the nation. The native of Mikarska, Croatia was an anchor in the Leathernecks defense, only allowing 14 goals all season. After his last season with the Demize, going to the USL Combine, Katic was picked up by the Pittsburgh Riverhounds in the USL 2. Katic now is a student assistant coach, focusing on the teams defense who only allowed in three goals in the last six matches of the 2009 season with during the PDL off season. Headlining the 2009 Springfield Demize Premier Development League roster was Kashif Siddiqi of Fresno Pacific. Siddiqi is a member of the Pakistan National team, having earned the right to play in Pakistan’s Olympic qualifier against Bahrain. The defender joined Fresno this season, and the team made it to the NAIA National Tournament. Fresno had a mental breakdown in the second half wit the game tied, and lost 3-1 to Florida natives Embry-Riddle. The Sunbirds finished their season 8-8-2. Siddiqi is a native of London, England and his childhood friend Luis Martin’s was brought in on his offseason while playing at famed Portuguese club Benfica. Martins has since moved on to get more game time, plying his trade in Denmark. Justin Ferguson of Belmont University had a less than fairy tale season, going 3-13-1 Overall. Ferguson had seven points in the season, scoring two goals and notching three assists. The defender played 16 games, staring 13 of them while picking up three yellow cards. Garden City CC made it to the Semifinals of the Region VI NJCAA National Tournament, falling to Barton County CC who also have hosted Demize Players. Garden City finished 15-4 Overall, while Barton advanced to the NJCAA Championship Tournament, finishing 7th with a 20-4 Overall record. . Tareq Al-Lugman and Adrian Loyacono made up the Garden City participants for the PDL squad, with Barton’s athletes competing in the 2008 PDL campaign. Drury was the biggest Collegiate supporter of the Springfield Demize, having upwards of 15 players throughout the 2009 calender year through the PASL and PDL teams. Danny Collins, David Emnett, Alex Palmer, Adam Peterson, Taylor Stacy, Ben Taylor, and Kyler Temple were all members of the 2008-2009 PASL Premier squad, with Stacy being named one of the Mid-Am Metal Forming MVP’s for the season. Making up the PDL squad were Andrew Bordelon, Marco Cherisma, Peter Higgins, Josh Hokanson, Connor McCellan, Micah Whorton, Blake Wilson, and former Drury all-star Ceasar Cereijo. In week Eight of the season, Cereijo was named the PDL’s keeper of the week, while Micah Whorton was nominated for one of the striker roles that same week. The Panthers went 21-2-0 overall, making the NCAA-II Super Region IV second round, losing to Lewis 1-0 at Harrison Stadium. The list of players above contributed to the best team in Drury history, breaking all records along the way. The new set records by these players are victories (21), goals (63), assists (54), shutouts (15), points in a season (180), and fewest goals allowed (11). Jake Harris was another defender to benefit from the Demize, going on to play for PASL Pro team Denver Dynamite. 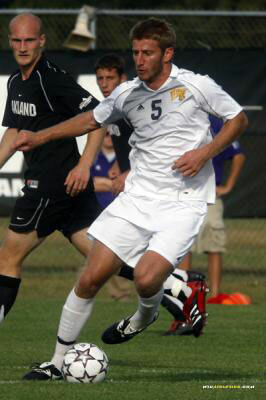 Harris played for Missouri State University before playing for the Springfield Storm, Bakersfield Brigade and the Demize in the PDL. Harris played on the Colorado Predators PASL-Premier squad before being signed to the Dynamite. The Little Rock, Arkansas native now plays for the US National Arena Soccer Team. Brett Thomas is a part owner in the Springfield Demize, on the coaching staff as well as being a player for the Demize. Thomas joined the Demize after playing for USL 2 side Northern Virginia Royals before moving into a coaching and ownership role for the Demize. Another USL 2 addition and Springfield local Cody Reinberg. Playing four years at Drury University as well as playing for the Demize during that stint before going to the Des Moines Menace in 2008. In 2009 Reinberg was brought into USL 2’s Harrisberg City Islanders where he is now the #7 shirt.